If you are looking for information on the CaribbeanCruiseLines.travel franchise business opportunity, CaribbeanCruiseLines.travel franchises or CaribbeanCruiseLines.travel franchising, then you have come to the right place. Our business is selling cruise vacations and cruise vacations are big business. You probably already know of family, friends, neighbors and work colleagues who have taken a cruise, and over 81% of first time cruisers become repeat customers. With your own online cruise travel agency they could easily become your customers. CaribbeanCruiseLines.travel allows you to embrace the power of the Internet to sell cruise vacations for you 24/7 through your own turbo-charged website featuring the newest point-and-click technology that allows you to compete head-to-head with the biggest cruise booking sites on the web. In addition, we allow you to offer some of the most highly competitive discount cruise fares in the industry. You can choose to work full or part time from wherever you please! This business can be operated from just about anywhere as a retail storefront or home-based Internet business. You can work at your own pace and there's no experience necessary. We offer the absolute finest training and the highest commission payouts in the cruise industry. Having your own proprietary, protected CaribbeanCruiseLines.travel website lets the world know you're there and helps you reach new markets and expand existing ones. And, every cruise sale made through your personal PIN# site is commission protected for you. Direct access to the CaribbeanCruiseLines.travel database means you'll have instant access to more of the cruise lines up-to-the-minute fares and close-in sailing sell-offs than you ever imagined possible. With CaribbeanCruiseLines.travel at your command, you'll achieve your business potential in no time. Ability to create full-color, online, informative, purchasable quotes for your customers. Marketing tools and revenue-management capabilities. Complete automated transactions reporting for booking, sales and commissions. Spell checking for all manual-entry fields. Translation of city and airport codes. Ability to build and export lists to direct-mail or e-mail programs. Ability to store customer profile data and preferences in a database. Reminders to call back or follow up with customers. Automated reminders for cruise final payments or failed credit card authorizations. Dynamic packaging allows you to build a complete multi-option cruise vacation package with airfare, hotel, car rental, cruise fare, shore excursions and trip insurance. Modifiable quotes can be created online and shown to a customer on a secure web site. Set up. Training. Ongoing support. You could invest a couple of million dollars to design your own technologically advanced, automated cruise selling website, but why waste the time and money when you can buy a turnkey, customized CaribbeanCruiseLines.travel "business in a box" that's ready to go for less than $10,000? The ability to trade under the CaribbeanCruiseLines.travel brand name. Your own CaribbeanCruiseLines.travel website, email address and voice mailbox. The best technology and most competitive prices in the industry. 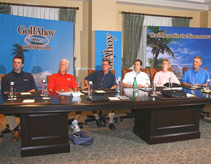 Training as a CCL "Certified Cruise Counselor". Easy to access user-friendly web tutorials. Dial-into teleconferencing seminars covering sales and marketing plans, business building plans, and lots more! CaribbeanCruiseLines.travel Independent Contractors (IC's) receive dynamic training to effectively sell cruises in an interactive environment. Certified CCL IC's sell 86% more cruises than their non-certified counterparts and typically see cruise sales productivity increases of 235% after completing the CCL approved 'Accredited Cruise Counselor' certified training course. And you can attend the on-demand online classes in the convenience of your home or office and work at your own pace. Education and ongoing training are the cornerstones of success. As an IC in training you'll receive an array of training materials including educational videos and a Cruise Marketing Essentials CD and workbook in addition to ship inspections which allow you to gain expertise by experiencing a variety of vessels firsthand. Graduating CCL Accredited Cruise Counselors also go on our "Seminar At Sea" training cruise. After graduation, CCL IC's can easily keep up-to-date on what's happening in the travel industry through informative teleconferences with CCL industry partners and travel suppliers. Owning a CaribbeanCruiseLines.travel business offers a product that is interesting, fun to sell, and provides many cruising and other travel opportunities for you. And, all you need to get started is an "up to date" computer, color laser printer and dedicated phone number with voicemail. If you're looking for a new and exciting opportunity that lets you work at your own pace, full or part time, then this may be the business for you.